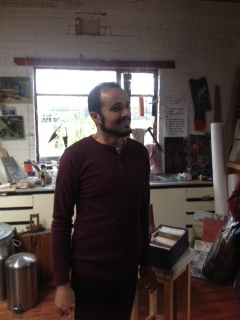 Today our Victoria University Artspace class, visited Paul Borg‘s studio. Based at home, in St Albans, he runs a workshop and studio out of his converted garage. The yard and surrounds are a plethora of found objects, recycled items and gathered paraphernalia. I got lost several times enroute, the VW’s nose not used to being pointed in a westerly direction. 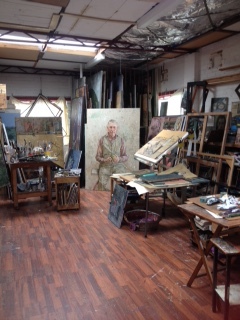 Inside the studio boasts a cornucopia of work. Vast, skilfully executed oil paintings of his, and surrounding backyards, local landscapes, religious icons, and unique portraiture. 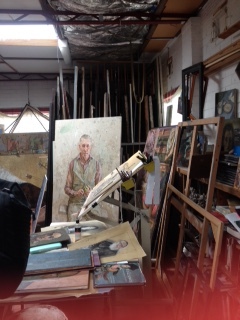 An exemplary brushman, he taught at VU Flinders Campus for many years, and showed us a series of drawings he completed on his daily train commute. Application to his craft, long working hours, self discipline, and inspiration from unlikely sources, are all building blocks of his creative practice. 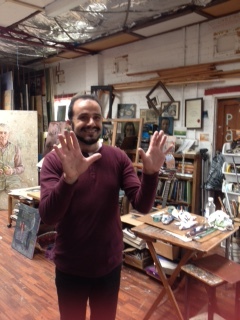 An informative Q&A session rounded off the interview, and we left his studio feeling privileged to be granted an expose to his work, specifically the family portraiture, which comprises a large part of his creative practice. On a cold monday night I ventured out to the Australian Tapestry Workshop, in South Melbourne, to hear a talk by Angus Trumble, the Director of the National Portrait Gallery. 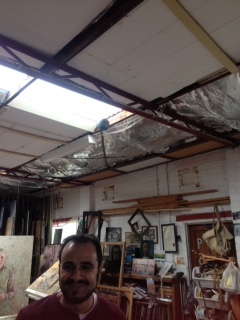 He spoke eloquently on how the work is chosen, the Gallery”s content and the the building in which it is housed.